Ahead of election, Iranian President criticizes Revolutionary Guards for writing anti-Israel messages on ballistic missiles. 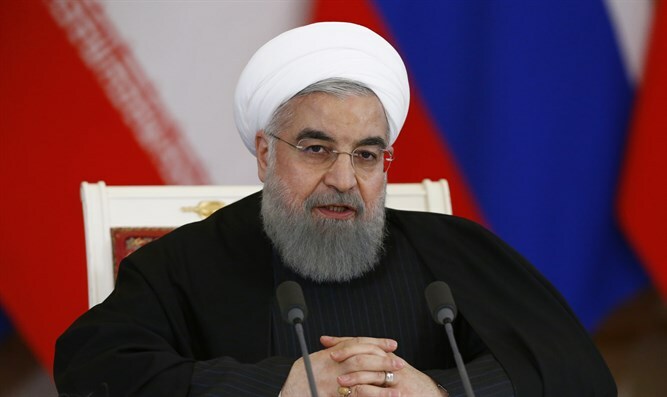 Iranian President Hassan Rouhani on Friday criticized the Revolutionary Guards for writing anti-Israel messages on ballistic missiles before testing them, AFP reports. Speaking at the second presidential election debate ahead of the May 19 vote, Rouhani also criticized his opponents for trying to sabotage the nuclear deal with world powers. "We saw how they wrote slogans on missiles and showed underground (missile) cities to disrupt the JCPOA (nuclear deal)," he was quoted as having said during the debate. "Our nation got through these issues because the majority of society chose morality and Islam from day one," he added. The missile test in question took place in March of 2016. The words “annihilate Israel” were written on the missiles, and Iranian officials claimed the missile systems being developed were needed “to confront the Zionist entity” and to ensure “its collapse”. Iran argues its missile tests are not banned under the 2015 deal, which curbed its nuclear program in exchange for a lifting of certain sanctions. Iran has continued to carry out ballistic missile tests despite international condemnations. In February, President Donald Trump's administration enacted new sanctions on Iran in response to the tests. Rouhani's remarks on the anti-Israel are surprising, given that Iranian leaders continuously threaten Israel and threaten to wipe it off the map. Rouhani, despite being touted by the West as a “moderate”, is no exception. Rouhani has in the past called Israel “illegitimate” and lamented that the crisis in Syria has made it difficult for Iran to focus on harming Israel. Shortly after being elected in 2013, Rouhani called Israel an "old wound" that "should be removed". Iranian media later claimed that Rouhani’s remarks were distorted. Rouhani has personally presided over “Death to America” chants during rallies in Iran, even though he claimed that Iranians “respect the American people”. In his remarks on Friday, the Iranian president said his conservative opponents in the election were linked to those trying to scupper the deal and broader outreach to the West. "When our diplomats were negotiating the deal, what were you doing behind the scenes? Some people acted like the opponents of the Iranian people," he said. He also vowed to improve civil rights -- a crucial plank of his 2013 presidential campaign which has been stymied by the conservative judiciary and security forces. "Civil rights are not just on paper, they will turn into practice. We will hold different sectors responsible," he said, according to AFP. Under Rouhani's presidency, Iran has set new records in the number of executions, many for political or religious "crimes". Rouhani has also done little in the way of freeing reformist political leaders who were jailed after protesting the 2009 election.